Holidays are always special on the Gulf Coast, and Easter is no exception. There’s a multitude of special Easter Sunday services, brunches, egg hunts and other festivals being planned for the weekend. So, whether you want to start a new tradition or make sure you family doesn’t miss any of its old traditions while you are on vacation, here’s a guide to some of the special activities being planned for Easter weekend. Worship on the Water. 11 a.m. Honky Tonk-style worship service at the Flora-Bama. Gulf Shores United Methodist Church. 6:30 a.m. sunrise service at the Hangout. Gulf State Park. 6 a.m. non-denominational sunrise service at the beach pavilion. Romar Baptist Church. 7 a.m. sunrise service on the beach featuring the Glorymen and Gladheart. LuLu’s at Homeport Marina. Egg hunt starts at 2 p.m., and the Easter Bunny will be on hand taking pictures. The Hangout. Billed as “The Island’s Largest Kids Easter Egg Hunt.” Brunch begins at 8 a.m. Activities for the kids begin at 11 a.m.
EGGstravaganza continues on the Village Lawn from noon – 2 p.m., where there will be a petting zoo, pictures with the Easter Bunny, live music by This Side of 49, train rides and an Egg Dash starting at 1 p.m. Make reservations by calling 866-966-6451. Perdido Beach Resort offers an Easter Buffet of traditional family favorites in their grand ballroom from 11 a.m.– 3 p.m. Brunch includes a visit from the Easter Bunny and an egg hunt at 12:30 p.m. For reservations, call 251-981-9811. Louisiana Pantry at the Wharf. Brunch on April 19 and 20 from 9 a.m. – 3 p.m. with a special Bunny appearance at each brunch. Bring your own camera to take photos. Easter Brunch Cruise— Alabama Cruises, 4575 South Wilson Boulevard, Orange Beach. Enjoy Easter Brunch as you cruise the waters near Perdido Pass from 10:30 a.m. – 1 p.m. Reservations are required and can be made by calling 251-973-1244. Funny Bunny Fun Run. April 19 at 8 a.m., The Gulf, 27500 Perdido Beach Blvd., Orange Beach. No entry fee to participate in this non-competitive 1.5-mile fun run back and forth across Perdido Pass Bridge. Live music, prize for the funniest costume and Slip ‘n Slide at the Gulf Restaurant. Bear Point Civic Association Easter Egg Hunt, April 19 at 11 a.m., Bear Point Civic Association Park, 5761 Bay La Launch Ave. Orange Beach. Hotdogs, hamburgers and drinks will be served until 1 p.m. Also includes Easter Bunny pictures, a bake sale and a raffle. The Wharf, April 19 at 11 a.m.Free Easter egg hunt plus face painting and balloon artists on the lawn. 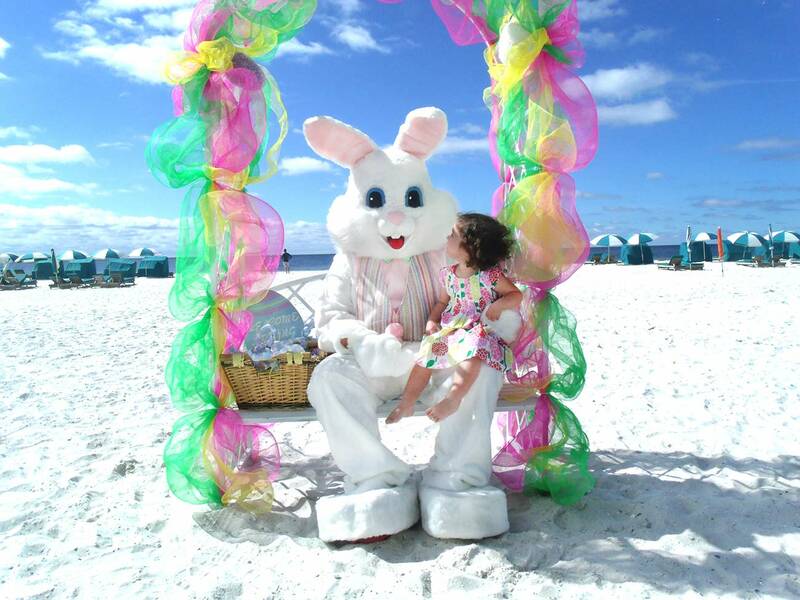 Flora-Bama, April 19 at 2 p.m., the Flora-Bama hosts a family friendly Easter Egg Hunt. If you know of other events being planned for Easter weekend, please add them in the comment section below.